Let's be honest, it'll be great to find one of the best record players for under 100 dollars with built-in speakers, Bluetooth, RCA output, a headphone jack as well as a USB output. 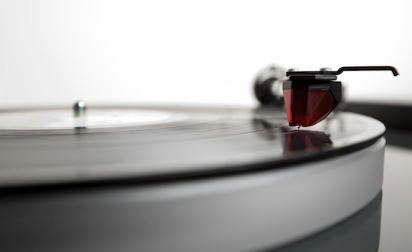 Whether you're a lover of vinyl records or you've just inherited some of your grandparent's stuff, you can still find the best audiophile turntables within this price range. If you've never had a turntable and you're still contemplating if getting one is worth it, it is advisable to buy an inexpensive record player first and then decide if there's a need for an upgrade. You can offer financial support to record stores as well as artists by acquiring Vinyl records instead of only streaming digital audio from your smartphone or PC. Whichever case applies to you, we've rounded up the best affordable record players with built-in speakers under 100 and you might also want to check out our review of the best record players under £100. A record player also known as phonograph or Turntable is a machine that recreates the sound that has been recorded on a circular disc called a vinyl record. This machine is majorly made up of an amplifier, turntable, and speakers, each of which helps to produce the sound you hear when the record is playing. A record player has a platter or turntable either made of metal, glass, ceramic or vinyl-coated MDF where the record sits and spins on. The record, on the other hand, has a groove on its surface which has sound vibration waves recorded on it. As this electrically driven turntable begins to rotate at a speed of 33, 45, or 78 revolutions per minute (RVM), the stylus head or needle placed on the groove vibrates in accordance to the sound waves it reads. Consequently, these vibrations are sent as audio signals by the cartridge to the phono pre-amp and then amplified before being recreated as sound by the speakers. At this point, you may have noticed our interchangeably use of the words Record player and Turntable to mean the same thing. While this is not wrong, there is a still a major difference between a turntable and a record player. A record player consists of a Turntable, amplifier, and speakers. It may even be built with RCA outputs, headphone jack, or USB ports in order to enhance its level of performance, hence they are also known as plug-and-play turntables. A turntable on the other hand, comes with a platter and tonearm which holds the cartridge that houses the stylus and its magnets. Accordingly, the sound produced by a Turntable will be very faint and as such, it needs its own speakers and amplifiers to produce high-quality sound. Nevertheless, call a record player a turntable and you won't be wrong. These are the tips on how to choose the best turntables in the market and as such, despite their wide array, you can still spot a good turntable not for its looks but for its features. If you want to buy a new turntable, then you must have already budgeted how much you're willing to spend on it. For a record player that you'll settle with to be considered as your best buy, in comparison with other devices in the same price range, its level of operation must be on par with them if not better. This level of operation can be determined by certain features which we'll go ahead and outline below. The major drives used in turntables are belt and direct drives. Each has an advantage over the other depending on what you want to use the turntable for. Belt driven turntables are general purpose record players that can be used in homes, offices, or while on the go. This can be attributed to the nature of their motor configuration. Here, an elastic belt is used to connect the platter to the motor and as such, the belt absorbs the vibrations created by the motor. Consequently, they produce high quality sound because the stylus head does not read these motor vibrations that may affect the resulting sound. Direct driven turntables, on the other hand, are most suited for Djing where a lot of scratching will be done. In this turntable design, the Platter is connected directly to the motor. You can scratch on the record for a long time without worrying about damaging any elastic belt which would've been the case while using a belt driven turntable. Moreover, this turntable for DJs plays at the selected speed immediately when switched instead of building up to the speed within some seconds. Whichever design you settle with should be determined by the purpose it's meant to serve. Do you want to place the turntable on one spot in your room? Would you rather move it around the house every once in a while and even travel with it? Now, that's left for you to decide. If portability is your priority, then you need to settle for a turntable that has a compact size and lightweight to enable you to place it on the shelf, desk, or travel with it. You'll even find some of the best suitcase turntables under 100. Whether it'll cost a fortune or just a couple of dollars to acquire a record player, your money is valuable and as such, the turntable you settle with must be durable. A record player that automatically places or removes the tonearm when the vinyl record is placed on the platter or when the record stops will prevent you from damaging the tonearm and even your records due to the forceful placement of the tonearm. You need to look out for a Turntable that comes with a cover case to protect the internal components from dust. Yes, it's a music player that's going to play your vinyl records but what else can it do? Via a wired connectivity with the use of cables, does it come with an RCA output which will enable you to connect to an external sound system? If it does, then you'll be able to amplify the sound if there's need to. In the same vein, a Turntable with USB output will enable you to transfer your records to a PC or MAC, and if it has a headphone Jack, you'll be able to connect your headset to it and listen to your records privately. 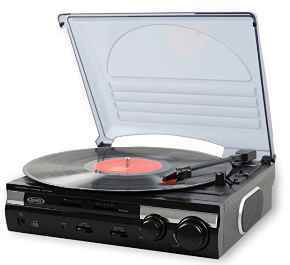 Some of the best record players under 100, 200, or 500 dollars come with an inbuilt Bluetooth receiver which streams songs from a Bluetooth enabled device such as an Android smartphone, iPhone, Tablet, Windows PC, etc. If these are the features you'll like, then these are the ones you shouldn't bat an eyelid to when choosing the best record players in 2018. Having reviewed several products on Amazon including the best wireless TV headphones, bone conduction headphones, and wireless lavalier microphones, you'll agree that we have got some level of experience in determining the performance of tech gadgets. This can only be attributed to the fact that we have greatly relied on the reviews of hundreds of buyers for a particular product on Amazon to ascertain the real-life operation of the device. Now, you should do the same too. Based on reviews, you'll get to know whether the Turntable is durable, or if it compromises sound quality due to motor vibrations read by the stylus, and also the distance covered when connected wirelessly. So, now that you know how to choose the best turntables in 2018, which brands should you keep on eye on and who makes the best record players? When it comes to Lavalier microphones, DJ headphones, Open back headphones, phonographic magnetic cartridges and several other audio types of equipment, a popular brand that will always be mentioned is Audio-Technica. Audio-Technica Corporation is a Japanese company that has been around since 1962 and one of the highlights of this brand is that you'll always find devices in different ranges. That is to say, from its low-end to high-end devices, each promises an acceptable level of performance irrespective of its price. 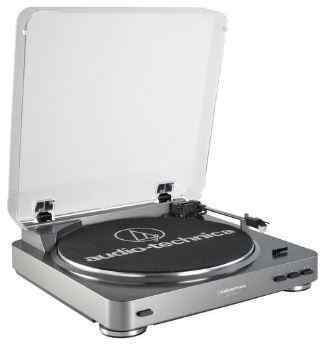 That is why most consumers have settled with this brand given the high ratings of the Audio Technica AT-LP60BK fully automatic belt-drive stereo turntable and AT-LP120-USB direct-drive professional turntable. On the other hand, if you're a die-hard lover of vinyl records and you're ready to spend the extra cash even as high as $999 for a premium record player, the brand you'll come to love is Rega. It may not have many customers as the other two brands given its price tag, but don't be fooled by this because it offers high-quality turntables. Some of these includes the Rega Planar 2 turntable with RB220 tonearm, glass-platter and carbon cartridge and the Rega RP3 turntable with dustcover, Elys2 cartridge, and RB303 tonearm. These machines are designed and manufactured by Rega Research Ltd., an audio equipment manufacturer that is based in the UK and has been in operation since 1973. Since we're not dealing with turntables within its price range, we've omitted them on our list. 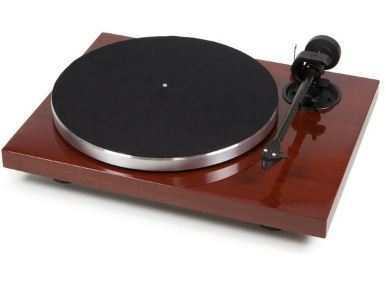 From the Dutch company, are Lenco turntables that are also considered to be among the best out there. Unlike Turntables from Pro-ject, you can still find turntables from this brand with an affordable price tag. Some reputable devices from this manufacturer include the Lenco L-84 USB record vinyl player with USB connection, Lenco L-85 USB two speed turntable with direct Mp3 recording, and Lenco turntable L75. 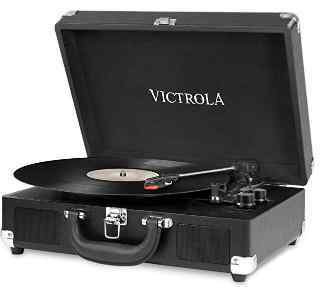 Another popular brand which offers some of the best affordable record players is Victrola. 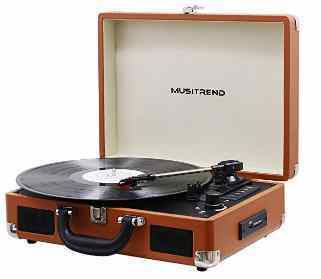 Its machines such as the Victrola Vintage 3-speed Bluetooth suitcase turntable with speakers and Victrola nostalgic classic wood 6-in-1 Bluetooth turntable are quite popular among users on Amazon as well as eBay and Walmart. Innovative Technology is the company behind this brand and it also specializes in the design and manufacturing of gramophones, stereos, and jukeboxes. Whether its a wooden, suitcase, retro, or modern record player you need, this company has got you covered. These are the makers of some of the best turntables in the market. Yes, we understand that there are several vintage record players under 100 from different manufacturers. For this reason, it can be difficult to decide on which to settle on given the high level of performance promised by each manufacturer as with the appealing look of the turntable. While looks may be deceiving as with the words of the manufacturer, you can rely on us to select the best record player with speakers for under $100. As a result, you don't have hundreds of machines to crack your brain with nor do you get only one to settle with. That's because we have narrowed down to only 5 turntables in the market that have been selected for their price, audio quality, drive design, and build. One of the best affordable record players is the Audio-Technica AT-LP60. At about $99, it has a lot to offer and has become one of the most popular turntables reviewed on Amazon affiliate sites. The AT-LP60 is a very portable turntable that does not take up a significant space wherever you place it. You can place it on a desk, bookshelf, and even move it around with ease. Equally, if you're looking for a portable record player under $100, this would be it. Sporting a dimension of 14.06 x 3.82 x 14.17 in and weight of 5.3 lbs, you'll agree that this machine has a compact size and lightweight. There is a removable hinged dust cover to protect the turntable and internal components from dust, and its Anti-resonance platter is made of aluminum to minimize vibrations. For easy operation, the AT-LP60 turntable automatically places the tonearm of the records and also removes the tonearm when the record ends. This is in a bid to maintain the quality of your records and also prevent you from mishandling the tonearm if it was to be manually placed on the vinyl record. Two-speed settings are supported by this record player and these are the 33-1/3 and 45 RPM. Consequently, you get to decide the speed at which your records will be played, only that it will be limited to only two unlike some turntables that come with at least three. Like most modern record players, the AT-LP60 also takes advantage of a belt drive design where an elastic belt connects its platter and motor. It prevents motor vibrations from tampering with the sound quality since the stylus will not read it. According to Audio-Technica, you can expect increased clarity and high-fidelity audio. For its tonearm build, you'll find a Dual Magnet phono cartridge connected to it with a replaceable diamond stylus. In terms of connectivity, you can connect cables to its RCA output to amplify the sound produced. It does not come with inbuilt speakers which means you'll need an external one and also there is no USB output that would've enabled you to digitize your records. Nevertheless, it is still a good mid-range record player in comparison with others in its price range. If you missed the inbuilt speakers feature that is absent in the Audio-Technica AT-LP60, here's the Jensen JTA-230 3 Speed Stereo Turntable with built-in Speakers trying to make up for it. You get it at almost half the price of the AT-LP60. Although we were unable to gain access to the Jensen record player website, Amazon states that this Turntable is designed and manufactured by the US company, Spectra Merchandising International, Inc. that was founded in 1981. The Jensen portable record player has a dimension of 13.38 x 13.75 x 6.38 in and weight of 5.5 lbs. Although it is slightly heavier than the AT-L60, it has a smaller size and for this reason, if you're all out for portability, then here's one more turntable to consider. Like the latter, it also comes with a removable cover to protect the turntable from dust whether it's in use or not. This record player uses a belt driven turntable where a belt connects the platter and the motor. That being so, you can expect uncompromised sound quality but then, it is not suitable for Djing given its belt drive design. There are 3-speed settings (33/45/78 RPM) in this Stereo for pitch control and as such, you can manipulate its speed to one that suits your needs. Much more, this machine comes with two inbuilt speakers whose job is to amplify the sound received from the phono-amp. Since it lacks an inbuilt Bluetooth, its auxiliary input jack makes up for it. Therefore, you can connect your Tablet, Computer, MP3 player, iPod, smartphone and other digital audio players to this record player using its USB cable and then it'll blare up your songs through its speakers. This turntable can be connected to a home music system via its RCA line-out jacks and connected to a headphone via its headphone jack. As a result, you can expect higher sound levels if that's the kind you look forward to. The Jensen JTA-230 diamond needle is removable if in case you need to replace it. Using the software it comes with, you can record, edit, and convert your audio content to MP3 Format. You'll find the Jensen JTA-230 user Manual packaged alongside this turntable and it'll show you how to use the record player. Unlike the Jensen JTA-220 and JTA-222 3 speed stereo turntables with AM/FM stereo radio receiver, you won't find one on this model. As already stated, one of the most popular turntable brands is the Victrola, whose manufacturer has been around for about 15 years now. The Victrola Vintage 3-Speed Bluetooth suitcase turntable with speakers has whole alot to offer and to think that it goes for just about $41 on Amazon. For starters, this is a portable suitcase turntable that has a small size and a lightweight. That is to say, at a dimension of 16.65 x 7.28 x 12.8 in and weight of 5.07 lbs, you can move it about with ease. Its briefcase design makes it easy to travel with and as such, you won't miss your favorite vinyl records while on the go. You can also get this turntable in different colors and patterns including Black, Pink Camo, Purple glitter Retro Map, Brown, Cobalt Blue, Cognac, Gray, and the American Flag. Thus, if you're a fashion enthusiast, you can find one in a color that meets your style. The Victrola portable suitcase turntable has three-speed settings for pitch control and these are 33 1/3, 45, and 78 RPM. You get to decide the speed at which your records are being played since you're not limited to only one speed. To further amplify its sound from the use of its internal speakers, this record player comes with an RCA jack and headphone jack. As a result, you can either connect it to an external system to get better audio quality or connect it to a headphone for a more private listening. Unlike the Audio-Technica and Jensen turntables, this one comes with a Bluetooth receiver which will enable you to connect wirelessly to any Bluetooth enabled device from even a distance of 33 feet in order to stream its content through the turntable's speakers. Its 3.5mm aux-in jack also allows you to play music from non-Bluetooth devices. Now you'll agree with us that this is an all-in-one portable music player, hence if you're looking for best in the US, UK, or Australia, this would be one of the best buys. 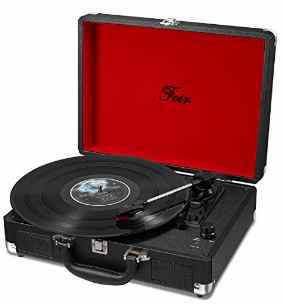 Another briefcase style portable record player with built-in speakers is the Feir Vinyl Stereo record player. And we agree with them! It is very portable at a dimension of 13.97 x 4.92 x 10.47 in, making it easy to change its placement on a shelf or table. Also, it takes on a suitcase design where the Wooden cabinet case is wrapped in a durable PU leather and it comes with a handle to make it easy to carry about. Color options for this record player include Turquoise, Red, Black, and White. For pitch control, the Feir TP204 Turntable has 3 selectable speeds which are the 33 1/3, 45, 78 RPM speeds settings. In line with this, you will be able to manually decide how fast or slow your record is to be played to your own entertainment. Integrated into this record player are two speakers, RCA Jack, and Headphone Jack. Accordingly, you can expect decent audio quality from its inbuilt speakers and also enhance it with an external sound system or a headset. This is a belt driven turntable that damps vibrations produced by its motor by connecting an elastic belt between its motor and platter. This will help to minimize vibrations that may cause the stylus head to misread the record's groove. You can digitize your records to a computer because of its Vinyl-to-PC recording capabilities which enables the conversion of records to digital files. Finally, here's the Musitrend Bluetooth record player and a portable suitcase turntable to look forward to. Like the Victrola's Vintage, this is also an All-in-one portable record player that has several features packed into one machine. But more about that in the Musitrend turntable review section. Now, Musitrend is a brand that has been around for about 10 years now and its makers specialize in the design and manufacturing of turntables. What's with the Musitrend record player? This is a briefcase-styled Vinyl record player that has a well built and compact design. You can take it anywhere and everywhere given the nature of its build at a dimension of 13.7 x 10.4 x 4.9 in. and weight of 6.17 lbs. It has a wooden interior and exterior leather wrapping to give you that old skool feeling as would be expected from using an age-long music player. Also, its cover case serves as a protection against dust that may accumulate on the machine especially while not in use. If you're looking for the best-looking record players out there, this would be one given its red and black color combo. This record player comes with a front-facing built-in speakers to deliver excellent audio quality. To enable you to adjust the speed of the record being played, it has 3 speed settings which are 33 1/3, 45, and 78 RPM. It might also interest you to know that this is one of the best portable record players with a USB port and SD port which will allow you to digitize your records and save your records on an SD card respectively. As a result, all your favorite records can be stored on your PC, Mac, as well as other digital audio devices. There's an RCA jack to help you connect this turntable to an external speaker and also a headphone jack that allows you to connect to a headset. This is a rechargeable record player that comes with a buit-in 2100mAh battery that promises up to 3 hours of music play time after a full charge. There is a Bluetooth receiver which makes for a wireless connectivity to an audio source whose content will be streamed and played through its speakers. The Musitrend needle is replaceable in case there is need to replace one that has been damaged. Alternatively, if your musitrend record player not working, you can contact the Musitrend customer service. Still undecided about this machine? then the video review of the Musitrend Bluetooth Record Player might clear your doubts. Given a wide range of record players in the market and with a price tag under 100 dollars, we had to put give some features utmost priority in our selection process. This was in a bid to ensure that any of these turntables you settle with, will be the best buy offering excellent value for your money. Our greatest determinant for the Turntable to be selected was the price. This is because if we were going to select a bunch of record players and compare their level of functionality, it was only fair for them to be in the same price range. Thus, you'll find turntables in our guide not more than 100 dollars. Whether its going to maintain one position on your furniture throughout its lifetime or you're going to move it around alot, it'll be nice to have a machine that doesn't look out of place in your sitting room. Equally, it'll fit with your room's decor while enabling you to move around or travel with it if there's need be. If you're not a DJ which we guess you aren't, you may need a belt driven turntable which you can just sit across the room with your glass of wine and have some comfort. Thus, each of these turntables feature this design which will prevent the stylus head from misreading vibrations. Our selected record players also come with additional features as would've been expected from a modern turntable. You'll find them sporting some or all of the following: USB ports, AUX inputs, RCA/headphone Jack, Bluetooth, as well as an SD card slot. Irrespective of what the manufacturer says about their product or the attractive price tag, you might want to check out what other users are saying about that particular product before dishing out your hard-earned money to buy it. That being the case, these selected few are from trusted brands whose turntables have received high user ratings and have been recommended by former buyers and its current users. With the best record players under 100, you don't have to spend so much before getting a quality turntable out there. These are turntables with built-in speakers, Bluetooth or AUX input, USB, Speakers, and even an SD card slot that will enhance your level of experience while you listen to your favorite vinyl record. Whether you are in the US, UK, or Australia take the next step and buy one of these from a reputable online store such as Amazon, eBay, or Walmart.